We get asked to do a lot of motorised roller blinds – particularly in kitchens where bi-fold and sliding doors have become such a major feature over the last several years. Stunning though they are, they often leave a bit of a headache post installation, as one’s mind turns to the practicality of soft furnishings to add some privacy after night fall – or solar shading during the day. So as with many such projects, in this case our clients were struggling to work out how best to tackle a combination of sliding, bi-fold doors and triangular windows! The kitchen and TV room are not overlooked, so the need for curtains or blinds were not initially a pressing concern, but the light made viewing the TV during the day problematic, and the large banks of windows left both rooms feeling a little exposed and uncosy in the evening. Anticipating installation of motorised blinds, our client had cleverly had the foresight to build ceiling pockets into the design – for both the bifold doors and triangular windows above, along with junction boxes running back to switched fuse spurs for the electrics. Detailed measurements were carefully taken and after viewing our collection of roller blind fabrics, our client chose a beautiful, claret coloured silk effect blackout fabric for the roller blinds. We recommended the Somfy Sonesse 40 system with its near silent operation and highly customisable settings. Our client was keen to have roller blinds in the triangular windows as well, but we advised them against this due to the likelihood of the roller blind fabric puckering given the shape of the windows. We recommended instead Somfy powered duette pleated roof blinds in a white blackout fabric. The duette system was more suitable for the triangular shaped windows because it is supported by guide wires, and consequently the fabric can be more effectively tensioned into these rather tricky, triangular shapes without distortion or puckering. The Duette differs from most pleated blind systems in that it has two layers of pleats, and the guide wires that support the blind pass up between the two layers – so you don’t see any wires when the blind is raised – an important consideration when you are seeking to minimise light coming through the blinds. With two Somfy remotes already operating roof lights in each room, client was keen to keep further remotes to a minimum, so we limited the operation of all 8 roller blinds and the 2 triangular pleated roof blinds to one additional (5 channel) handset. The single doors in each set of bifolds operate on their own channel of the remote – to enable our client to easily raise the single door blind in each room, should they wish to go outside. A further channel operated every single blind simultaneously, with the two remaining channels operating the TV room blinds. 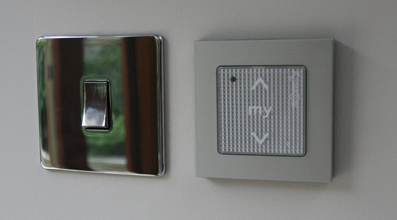 Additional functionality in the form of a wireless wall switch enabled all the blinds to be operated simultaneously, and the TV room blinds lowered to a pre-set midpoint. Although our client had lived without blinds for over a year since completing the extension, they were immediately amazed at just how the new blinds transformed the two rooms into a more cosy, enclosed space – particularly during the evening.